This is an old drink, dating back at least to 1889. But it’s been forgotten about in recent decades. That’s probably because one of its key ingredients – celery bitters – went out of production. But good news! Celery bitters are available again in the US, so we can start making drinks (like the Fourth Regiment) that call for them. We learned about this drink from Robert Hess, and we use his recipe. 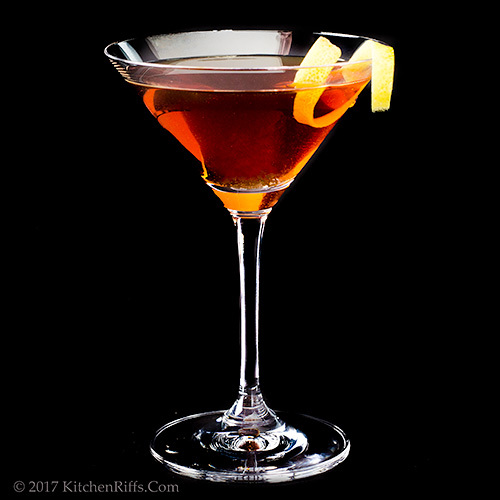 Our friend Greg Henry also has a nice version of this drink on his blog, Sippity Sup. Place all ingredients (except garnish) in a mixing glass half filled with ice. Stir briskly until well chilled. Strain into a cocktail glass (preferably one that’s been chilled). Garnish with a lemon twist, if you wish, and serve. This drink is equally good served on the rocks in an Old Fashioned glass. And it’ll stay cold a bit longer – important in warm weather. We generally stir (rather than shake) this drink because all the ingredients are clear. Shaking introduces small oxygen bubbles, which can make a drink cloudy. Cloudiness isn’t a problem when you mix a drink with opaque ingredients (like citrus, for example), so we generally shake those. But shake this up if you want. We often do. That “different drummer” thing, you know. 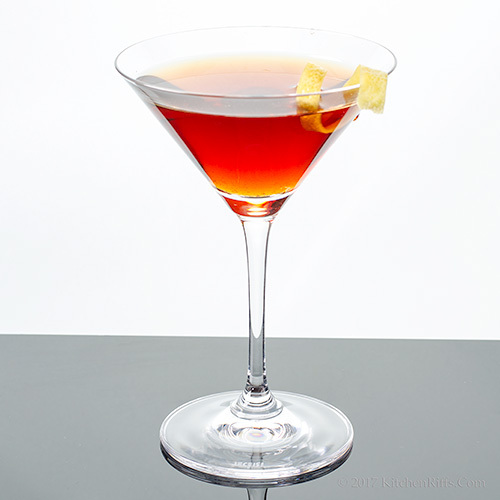 We like to use rye in Manhattans (and their variants), but many people prefer bourbon. Use whichever you like – as long as it’s of good quality. 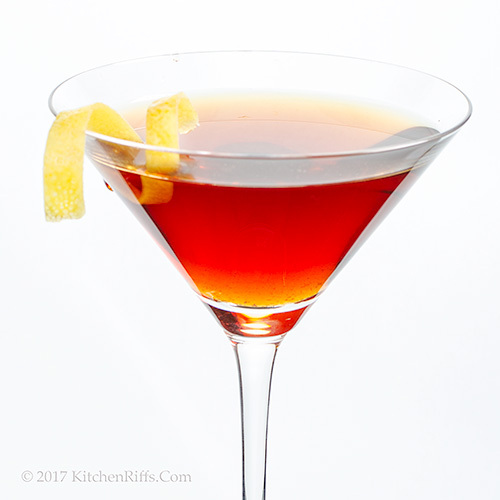 The ratio of sweet vermouth to whiskey (1:1) in this cocktail makes the drink a bit on the sweet side. So use good-quality sweet vermouth (any name brand will work). Celery bitters make a fun ingredient, with a fragrance that reminds us more of dried celery than fresh – but in a good way. If your local liquor store doesn’t stock celery bitters, you can find them online. The two brands we know about are Bitter Truth and Fee Brothers. Both make good-quality stuff. Angostura bitters aren’t traditional in this drink, but they make an interesting substitute for Peychaud’s. “Along with the drinkers’ watches and wallets, no doubt,” said Mrs K R.
Hi Greg, this is such a good cocktail, isn't it? I need to play with celery bitters -- SO good. Thanks for the comment. A sweeter drink can be very nice especially in this hot summer weather. Hi Laura, sweeter drinks ARE better in warm weather, aren't they? Thanks for the comment. I love the sound of celery bitters! I've never tried them but they sound perfect in this! Wow, celery bitters? So intriguing---I'd definitely love glass to sip on! Hi Kelsie, they're really an interesting ingredient -- worth a try. Thanks for the comment. Hi Liz, celery bitters are wonderful! As is this drink. :-) Thanks for the comment. Manhatten's aren't generally my thing but I'd love to try this with the celery bitters. It sure does look pretty in the glass; I'm a sucker for drinks served in martini glasses! Happy Fourth to you and Mrs KR! I've had a bottle of celery bitters for about eight years and have never once used it. 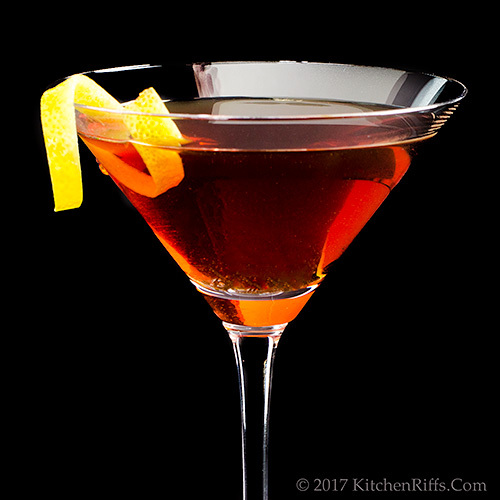 Time to bust it out tonight--I love Manhattans! Hi Eva, those glasses are irresistible, aren't they? Thanks for the comment. Hi Marshall, you'll love celery bitters in this! Really good. :-) Thanks for the comment. I am a big fan of playing with bitters, 3 is a whole lot of playing. I never new there was such a thing as celery bitters! Peychaud I adore! Looks like a great cocktail! Hi Evelyne, off the top of my head I don't recall another cocktail that requires 3 different bitters. Although I'm sure there's something out there -- sounds like a fun research project. :-) Thanks for the comment. I can just see myself sipping this while watching the chicken cook on the grill. It sounds so refreshing! Hi Tricia, it is refreshing! Very enjoyable. :-) Thanks for the comment. I'll be on the look out for celery bitters, what an intriguing flavor. A lighter cocktail for summer sounds divine! Hi Deb, celery bitters are fun! Gotta find other ways to use them. :-) Thanks for the comment. Oh, I'm loving this cocktail because I'm a big fan of a good Canadian rye whiskey and most people will tell you that it is a winter drink and can't be had in the summer. Hi Robyn, I don't have a lot of experience with Canadian whiskey, but love any and all whiskey so I'm sure I'd love it! Gotta look for Wiser's. :-) Thanks for the comment. Celery bitters? That's a new one on me. Sounds like they are the highlight of this cocktail. Thanks for a light summer cocktail. Hope you had a great 4th! Hi MJ, the celery bitters do add quite a bit -- amazing how much effect one dash of something can have! Thanks for the comment. Thinking over ice is a great idea for this delicious drink and the heat of Asia.... Hoping your 4th was filled with fun. Bitters made with celery? Now I am really intrigued! The cocktail looks so beautiful. Hi Anne, celery bitters aren't used enough! I'll have to find some other drinks that use them. :-) Thanks for the comment. Hi Bobbi, on-the-rocks definitely is a nice way to drink this -- makes it a bit more of a slow sipper that way. Thanks for the comment. Hi Angie, celery bitters are FUN! :-) Thanks for the comment. Hope you had a magnificent and yummy Fourth of July! Cheers to this and many awesome drinks of yours! It's been too long since I've had a Manhattan... I've never tried a Fourth Regiment but I think it sounds amazing. Hi Pam, Manhattan's are good, aren't they? The Fourth Regiment is really worth a try -- it has a somewhat unusual flavor. Thanks for the comment. Celery bitters? How interesting. You come up with the most fascinating cocktails! Hi John, look like another wonderful drink, never heard of celery bitters before, sounds delicious! Hi Chris, research, research, research. :-) Thanks for the comment. Hi Cheri, it is! And celery bitters are a neat ingredient. :-) Thanks for the comment. Can't wait to track down some celery bitters! I have never heard of celery bitter...sounds really delicious. I must look for it. Hi Debra, enjoy! :-) Thanks for the comment. Hi Juliana, they're really neat! I knew about these and have had a bottle for a couple of years that I never opened -- until I made this drink. :-) Thanks for the comment. Hi Nisha, you might want to serve this on-the-rocks and sip it slowly. :-) Thanks for the comment. Celery bitters! I am definitely intrigued by that ingredient. I shall have to try and hunt it down in the UK. I'd love one of these cocktails. Hi Emma, celery bitters have such fun flavor! You'll love them in this drink. :-) Thanks for the comment. I also have never heard of celery bitters. I love bitters and use them quite often. Your photo is fantastic. Hi Gerlinde, there are all sorts of bitters out there these days. Fun to play with! Thanks for the comment. I love a good summer cocktail and this one sounds perfect with all of the bbq we eat here in Texas! Hi Pamela, this is SO good with BBQ! Great combo. :-) Thanks for the comment. Hi Carolyn, straight bitters are always memorable! :-) Thanks for the comment. I have started drinking good old cocktails and reinventing them again! They bring so many good memories! This one looks perfect! Hi Katerina, it's nice to have a cocktail now and again, isn't it? This is a good one! Thanks for the comment. Hi Amaila, mixing one right now! :-) Thanks for the comment. Hi Ritu, bet you'd enjoy it! :-) Thanks for the comment. I'd have no problem sipping one of these along side my BBQ! Looks like one tasty cocktail. Hi Amy, having one of these is a good reason to have BBQ! :-) Thanks for the comment. Wow celery bitters, never heard of them before. Looks like a nice cocktail :). Hi Amira, celery bitters are really fun! Nice flavor. :-) Thanks for the comment. I love your pictures they are beautiful as usual. I am with everyone else I have never heard of celery bitters. I would love to try this one. Hi Dawn, celery bitters are good! Playing with them now -- seeing what else we can use them in. :-) Thanks for the comment. I hope your 4th July was fun, John. This cocktail looks so pretty and looks awesome. I am so intrigued by the name of this cocktail. Celery bitter is so new to me, I would have to look for this. How perfect this is for this summer time. Hi Anu, we love bitters in general, so it's fun to have celery ones to experiment with. Thanks for the comment. Looks right up my alley. I love bitters although celery bitters are new to me. I'll have to try them out–definitely intrigued. Hi Frank, you'll enjoy the celery bitters! Really fun. :-) Thanks for the comment. I love a Manhattan. I'd be eager to try one of these. Hi Jeff, Manhattans are SO good, aren't they? Wonderful drink. As is this. :-) Thanks for the comment.